After Jason shared his design of a XC95144XL breakout board, we made our own breakout for the same chip. It features a single row of 39 pins that can be interfaced with a standard bread board. All the remaining pins are broken-out to dual-row headers on top of the board. A 800mA 3.3V voltage regulator provides adequate power for any CPLD configuration. The IO pin power supply can be connected to the on-board 3.3volt supply, or you can use an external voltage (1.5-3.3volts) from the VIN header. As with our smaller CPLD boards, we connected an oscillator to one global clock pin. One user LED is available as well. Free PCBs for this project should become available in a month or so. We will be posting new project previews or prototypes every Thursday, so be sure to check in. This entry was posted on Thursday, November 24th, 2011 at 9:00 pm	and is filed under CPLD, dev boards. You can follow any responses to this entry through the RSS 2.0 feed. You can skip to the end and leave a response. Pinging is currently not allowed. Nice rendering. I assume you used EagleUp. Did you have to model some missing parts yourself? Eagle up rendered the large 100pin package but rotated with the wrong pin showing as 1. it also rendered the voltage regulator Ic and all the caps and resistors. I had to make all the headers myself, and the oscillator…. Their part database is really poor. But it pays to use it, if for nothing else just to see how the board will turn out. Its by far the best way to easily spot any silkscreen errors and misplaced vias…..
Will this board be available for sale through Seeed? If so, any ideas on the likely price? By the way, if you wanted to design for higher clock speeds, I’d suggest several things: 1) place clock chip as close to CPLD clock input pin as possible. 2) avoid a “T” intersection on clock line, and 3) the clock line should not cross a ground plane split. not really necessary since the boards are intended for breadboards and they limit the high freq way more then the routing. But you are correct, if this was a development kit the rules you mentioned would apply.. Yes, I also do like EagleUp a lot. It would be nice if you could submit your custom parts to the EagleUp warehouse so that it can improve. Is the breadboard already in the warehouse? I didn’t find it. I found it somewhere but I cant remember where, If you want me to send it over, PM me in the forum and I’ll upload it to megaupload and link it..btw my forum nick is arakis. 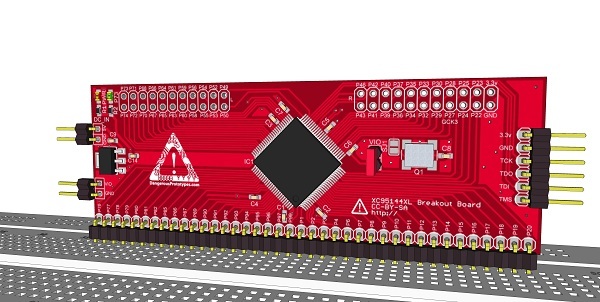 These standard 0.1″ headers with square pins damage plug-protoboards. The pins are too big so the protoboard sockets get spread out – permanently. Problems will show up over time, especially if you try to plug in a component with a small lead diameter. I use machined round pins instead, but they’re pricey and hard to find with pins that are long enough. @Drone: I cannot confirm your observation with 0.1″ pin headers. I use them regularly, and the the spring contacts are still fine. Maybe it depends on the breadboard? I have some with extremely stiff springs and others with more soft springs. Only when forcing a TO-220 package into the breadboard I noticed some relaxing of the spring contacts. Thanks for your comment. I use generic plug-protoboards available locally (I’m in Asia). Very likely they’re from China. I have no affordable access to any other type of plug-protoboards. They are cheap, as low as a few USD each (16.5cmX6.5cm), but sometimes as much as US$5-$7 each. These are generic protoboards, two independent power rails on each side side with a power rail break in half-way down the board. They are all white in color. They can inter-lock side by side. These protoboards have double-sided foam tape backing, which can be removed so I can take out and re-bend the receptacles to grab better after plugging in square 0.1″ headers. After removing the double-sided tape, But this can be done only so many times without buying some more foam tape to replace what was removed. If I make a dead-bug breakout for SMT parts for use with the plug-boards, I use some stiff solid round wire instead of the dreaded 0.1″ square pin breakaway headers. The 0.1″ square header pin-spread problem is real – at least with the protoboards I have (and I’m sure many around the World have too). As for the TO220 issue. I have the same problem. What I do use a pair of needle-nose pliers and rotate the TO220 pins 90 degrees before plugging into separate rows of the plug-protoboard. This limits the over-spreading of the receptacles by the TO-220 pins. The leads can be bent back to their normal orientation before soldering into a through-hole PCB if you like – often necessary before bending the TO-220 over to physically mate with a heat sink.